Read EM4100 series RFID tags at a distance of up to 6cm with this reader. Replaced by the 1024 - PhidgetRFID Read-Write. 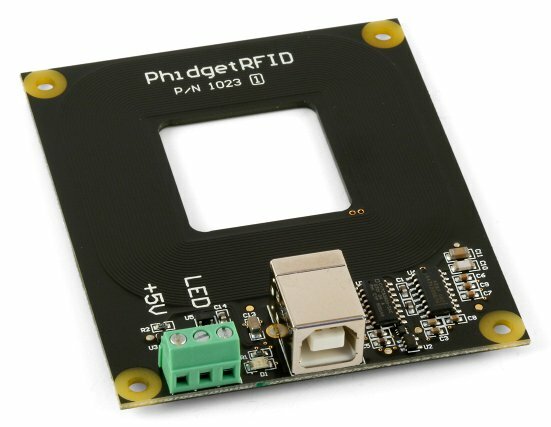 The PhidgetRFID reads RFID tags that are brought in close proximity to the reader and returns the tag identification number. RFID (radio frequency identification) systems use data strings stored inside RFID tags or transponders) to uniquely identify people or objects when they are scanned by an RFID reader. These types of systems are found in many applications such as passport protection, animal identification, inventory control systems, and secure access control systems. The PhidgetRFID (as well as the RFID tags sold by Phidgets) uses the EM4102 protocol. Any other tags that also use the EM4102 protocol can be used with the PhidgetRFID reader. 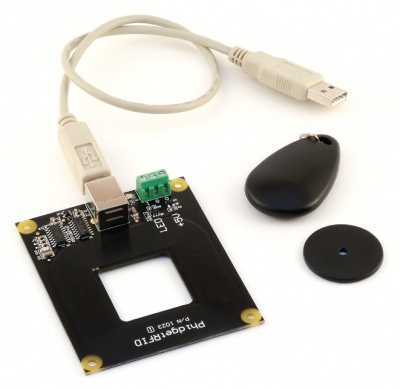 If you need some tags with the RFID reader, have a look at the 2002 - PhidgetRFID Kit which comes with an assortment of tags. April 2004 0 200 Onboard LED, 2 Digital Outputs added. Ability to enable/disable Antenna added. January 2006 0 202 Onboard microprocessor upgraded to Flash version. April 2007 0 205 Protocol parsing bug fixed which garbled top 3 bits of RFID Tag. July 2007 1 206 Unused internal I/O pulled high out of an abundance of caution, bus current characterized. Terminal block moved to edge of PCB, center of antenna routed out, digital output transients on startup eliminated. June 2013 Product Discontinued. Succeeded by the 1024 - PhidgetRFID Read/Write. The 1024 differs from the 1023 in its ability to write to tags with the T5577 chipset, and to read tags belonging to a number of additional protocols. 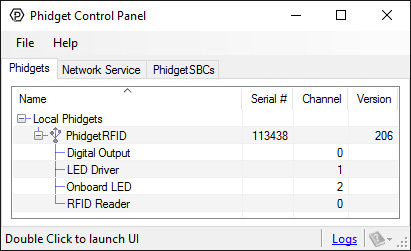 Connect the PhidgetRFID board to the computer using a USB cable. Now that you have everything together, let's start using the 1023! In order to demonstrate the functionality of the 1023, the Phidget Control Panel running on a Windows machine will be used. Linux users can follow the getting started with Linux guide and continue reading here for more information about the 1023. Bring a compatible tag close to the 1023 and the tag's string and protocol will be displayed. Toggle power to the antenna using the checkbox labelled Antenna Enabled. Toggling antenna power decreases power consumption, however, the 1023 will no longer be able to read tags. The PhidgetRFID has four outputs - two of which are available to the user. Output 0 is a 5VDC source from the USB bus through a P-Channel MOSFET with less than one ohm impedance. This can be used to switch a TTL or CMOS device, or it can be used to drive a 5VDC relay such as the Aromat JS1-5V. Output 1 is an LED drive output at 5VDC with maximum 15mA of available current (250 ohm CMOS output). Both Output 0 and 1 are available in hardware at the terminal blocks on the PhidgetRFID board. If Output 0 is used to drive a relay, a fast clamping diode must be placed across the relay drive pins as shown in the diagram on the right. Not doing so can result in permanent damage to the PhidgetRFID board. 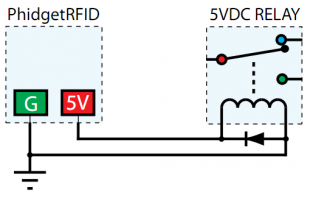 If you are using multiple RFID readers, placing them too close together will cause interference when reading tags. You can work around this problem by rapidly "polling" each 1023 by turning the antenna on, checking for tags, and then turning it off in sequence. Of course, this will lengthen the amount of time it takes for your system to read a tag, since you may have to wait for the nearest reader to become active. When trying to read tags, you should allow the tag to remain within detection range for at least 50ms. Tags moving through the detection area faster than this may not register.